Imbolc is perhaps one of the most quietly exciting festivals of the Celtic year. It is a celebration of the emerging life and an awakening of natural world around us. You may starts seeing new life peeking through the soil, and buds emerging on trees. Imbolc is a time for bringing new life to old projects and allow the ideas you have been reflecting on over the winter months to take hold. Imbolc is an important date in the agricultural year associated with fertility, abundance and growth. It is when farmers would prepare their fields for the first sowings and fishermen would return to the sea after the winter away. Part of the early spring vibe of Imbolc in agrarian societies has also been the lactation of mother animals. Cows’ udders are starting to swell with milk at this time of year, just in time for the first births of spring. This is why the Sabbat is often associated with milk.For me, Imbolc is a reminder of the powerful and symbolic bond that mothers have to their children. Mothers giving their own milk to their own children as a basic right might seem like common sense. This bond is shared between all mammal mothers and their babies. Of course, industrialization and the growth of factory farming have vastly changed our relationship to other animals. Most milk cows have their babies taken away from them, so that there is more milk for humans. The babies of the big dairy industry are unwanted byproducts; especially the males. Even at small operations, it is not cost efficient for male babies of dairy calves to be kept. Even though fewer people are eating veal, these babies must be removed from their mothers at dairy operations, and are often disposed of. Cows are very maternal, and grieve horribly for their children. In fact, the maternal aspect of cows has caused them to be a symbol for many goddesses, including the Egyptian goddesses Hathor and Nut, and the Norse goddess Brigid (who is possibly the daughter of or another version of the cow goddess, Boann). The anguish of the Greek goddess Demeter when her daughter is stolen from her is easily rivaled by the misery of mother cows in a dairy operation. This is why I like to send a prayer to cows on Imbolc. Fortunately, we no longer need to get all our milk, cheese, or desserts from animal milk. And it has never been easier for many of us to choose to forgo animal products completely. Milk can be made from many different plants. Almond milk, soy milk, and coconut milk seem to be the most popular. But people have long had access to rice milk, oat milk, and hemp milk as well. And yes, there are also plant-based options for cheese, ice cream, whipped cream and the like. So if a spell for Imbolc calls you to drink milk or have a milk and honey bath, I hope you think about the mothers who have been separated from their children and choose soy instead. One way to bring the magic of Brigid into your home at Imbolc is to make a Brideog (pronounced Bree-jog). Traditionally, men in the home made the little Brideogs to hang over the doors of their home. To make your own Brideogs are made with straw or grasses twisted into the shape of a doll, wrapped in fabric to make a dress and decorated with the first flowers, greenery from the garden, and other pretty things you find in nature. Brigid crosses are another craft to be made at this time of year. Soak straw overnight and weave is around a frame made of sticks. There are various styles, some with three or four arms, so get creative. Hang your Brigid cross wherever you like in your home. Traditionally, children’s were hung over their bed and it was believed that a Brigid cross tucked under the mattress helped aid conception. They were used to bless seed before planting in spring. As with many Celtic celebrations, an Imbolc tradition is to light a fire. Fire celebrates the Fire Goddess Brigid, and also recognized the returning power of the sun. In the Christian calendar, Imbolc is known as Candlemas, when candles are lit for Virgin Mary. Gather your family and friends for the fire lighting, and reflect, share and laugh together. Imbolc is also a time of feasting so you might want to make some food you can cook in the fire, and toast some marshmallows! Imbolc is a time of cleansing. Now is the perfect opportunity for a good spring clean of your home. Get rid of anything that is cluttering up your home and stagnating the energy, and scrub all the surfaces down thoroughly. If you can bear the cold, open all the windows and let some refreshing clean air flow through your home. Traditionally, Imbolc was a time for visiting holy water; a spring or a well, to both purify us and bring fertility to our dreams. To continue this tradition, take a walk with family and friends to find some water near your home: a river, stream, or well. If the water’s clean, splash some over yourself as you set your intention to cleanse and purify. Try dipping a piece of ribbon in the water and then hanging it from a nearby tree (trees near water are especially sacred) to carry messages of hope and healing. Thank the spirits of the place you visit and pick up any rubbish you see nearby as an act of gratitude. 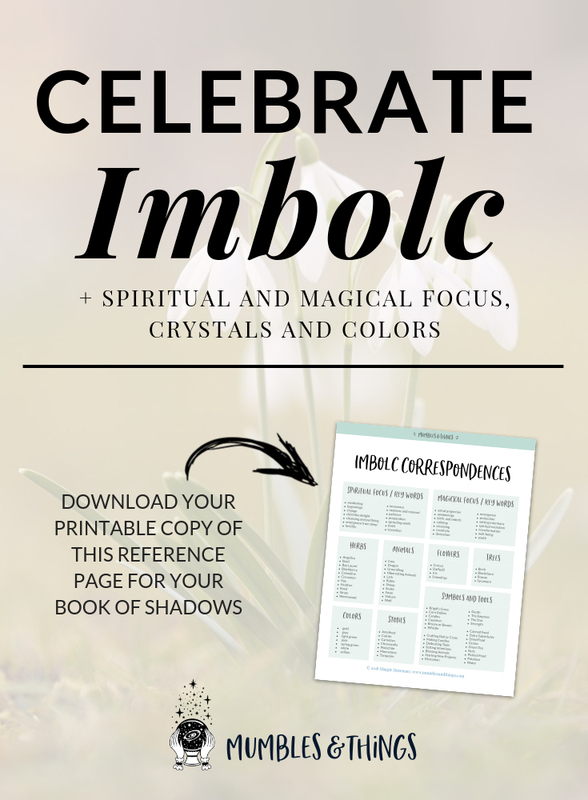 Follow my Imbolc board on Pinterest for more ideas! What are some of your Imbolc traditons? Tell me about them in the comments below.